U Drive is a central file storage for users that provides students, faculty and staff with a place to store files that can be accessed from anywhere, on- and off-campus. This service is funded by the UW-IT Technology Recharge Fee and the Student Technology Fee. Students can store up to 50 GB of data, which is automatically backed up. This service is activated automatically for all students; you can use it right away. Faculty/ Staff are allotted 50 GB of data, which is automatically backed up. If you need more space than that, your quota can be increased with a UW Budget number on the Manage Your UW NetID Resources Web page. Note: This service is not appropriate for storing regulatory-protected data, or sensitive information that may be subject to compliance regulations. See Information Security and Privacy Laws and Regulations for more information. Sponsored accounts are allotted 50 GB of data, which is automatically backed up. If you need more space than that, your quota can be increased with a UW Budget number on the Manage Your UW NetID Resources Web page. The U Drive has shown slow performance while opening and saving Microsoft Word for a small subset of users. Details (and a way to record if your computer does or does not suffer from this issue) can be seen here. Students: U Drive is automatically activated for all students. Faculty/Staff: U Drive is automatically activated for all Faculty/Staff. Navigate to your Manage Your UW NetID Resources Web page. Click on “Subscribe” or “Unsubscribe” to update your account. This page is also where Faculty/Staff should be able to purchase additional quota with a UW budget number at a rate of $0.15 per GB per month. If a user’s usage is “well below” the new limit, their quota will be silently dropped to the new limit. “Well below” is defined as “The usage plus the lesser of 25% of the limit or 250 MB is less than or equal to the new limit.” In particular, a user with zero usage and a new limit of zero will be silently dropped to zero. A warning email is generated explaining that the limit is going to be reduced in two weeks. When the deadline arrives, the quota is lowered. Prior to the deadline, the user’s quota is dropped to their current usage plus the 25% / 250MB grace value rounded up to the next gigabyte whenever their usage is “well below” the existing limit. Students’ quotas are set to 50GB as long as the total student usage of the service does not exceed the 15TB limit. To manage this quota after transitioning, go to the Manage Your UW NetID Resources Web page. In the case of the Faculty/Staff having greater than 50GB for their quota, limits will be lowered to 50GB and changes may occur depending on how much of the quota is being used. When a Faculty/Staff changes their affiliation or adds an affiliation for Student status, they will be able to manage their storage quota for their U Drive services on the Manage Your UW NetID Resources Web page. Press Windows-R (Press the and R). When prompted for Username and Password, enter as NETID\username, followed by your UW NetID password; Click OK.
Press Command-K (or Go -> Connect to Server from the menu). 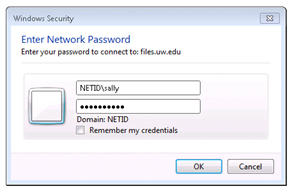 When prompted enter your UW NetID username and password. You may access your files via the SFTP protocol from off or on campus. This allows a more traditional way of moving files to and from the U Drive, and does not have network restrictions. Basic instructions are below. Free SFTP programs are available from a number of sites on the Web. A common program is Filezilla, but others are available. You may wish to check with your local support team to see if there is a preferred software package. When downloading such programs, be VERY CAREFUL to read the complete text and especially the text for any checkboxes before clicking the download button. Otherwise you may unintentionally give the site permission to download and install other programs or adware; many such programs are malicious and very hard to remove. The following table outlines the basic connection settings which can be used with SFTP programs. The Central File Storage with the UW, U Drive, is not a shareable drive. Some alternatives that are available for file sharing are UW Google Drive, Dropbox, or UW OneDrive for Business (formerly UW SkyDrivePro). The U Drive service provides access to previous versions of your files providing one version a day for a week, one version a week for a month, and one version a month for 3 months. These versions of your files are called snapshots. All of your U Drive snapshots are stored in a directory (location described below) called “udrive”, and the name of each snapshot directory reflects the date it was created. The Central File Storage Service is provided to support UW activities and is subject to state laws and UW policy. Use caution when storing sensitive information. This includes personnel data, patient records, student information, and financial information. For more information, see the General Rules for Collection, Use, and Disclosure of Institutional Information. 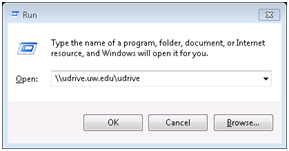 U Drive share can be mounted as a traditional Windows network drive by users, via a logon script, or via GPO. While any letter maybe used, departments are encouraged to use “U:” if feasible to provide a standard mount point across campus. This information is for units who have a UW-IT Computer Support Org set up. The AD attributes for “homeDrive” and “homeDirectory” can be set via the support group tool under the NETID Domain Settings section. This will cause Windows to automatically map the U Drive upon login. Programs that use the user variables %HOMEDRIVE% and %HOMESHARE% will be able to make use of the U Drive automatically. 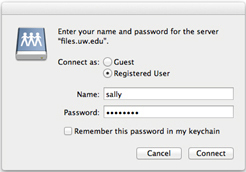 Subsequent mounts of smb://udrive.uw.edu/udrive should complete without a username/password prompt. Additionally Macs and Linux machines joined to a UW NetID delegated OU support SSO for users logged on via NetID credentials.